I had a great conversation last month with a Westminster colleague, Kay, as school was winding down. While from completely different academic departments, our daughters are nearly the same age, and so we share lots of parenting ideas and stories. Here’s some thoughts we developed to use with our kids this summer to enhance creative thinking and enhanced abilities in many areas. Our daughters LOVE to read, so our first challenge to our girls would be for them to find a good stopping place 20-40 pages before the end of each book they read. Then we encourage them to describe how they think the story might end and why they think their hypothesis is possible. If they see multiple ways it could end, they could describe alternates. They should WRITE their predictions to get their minds to commit and more actively engage. This need not be anything formal–but it can be if they like. We just want the girls to think a bit more deeply about what they’re reading and engage. Use what they know has already happened to draw conclusions about what might have happened. After their informal (or formal) writing, read the remainder of the book and compare their prediction(s) to the author’s chosen end. How close did they come to the author’s conclusion? What information did the author use to end the book that they didn’t use? Was the author’s conclusion reasonable? Was theirs? There’s not any particular right or wrong here for us beyond getting our kids to think about what they’re reading and to engage the process. We also hope they will become more attentive to details in their reading. Allow the kids to help plan meals; help them understand the daily processes for planning nutritious meals. Encourage them to participate in cooking, especially for anything you cook from scratch. What choices do you make and why? For cooking, talk to them about what the different ingredients do for the resulting dish. Have them make predictions about what will happen when new ingredients are added or the collected ingredients are prepared. To the best of your ability, explain what each step does and why it’s important to the final product. Compare the predictions to the final results. When some part inevitably turn out differently than predicted, learn why. Take pictures along the way for you or your child to use when comparing hypotheses and outcomes. When you come back to a recipe on another occasion, think about how it turned out last time and plan a change or an improvement. Knowing what your child wants to happen, can she adapt the preparatory steps to accomplish that change? In the end, this really isn’t all that different from the reading suggestions. Engage, observe, explore, make predictions, and compare expected and actual results. All along, use data to explain why you believe your claims are justified. computer programming (getting a computer to do precisely what you ask of it), and so on. Engage your children or your students. Get them to hypothesize and justify using data. Teach them (and yourself) to be more alert to patterns and clues about past and future behavior. Perhaps most importantly, determine if other outcomes are possible and what it would take to get there. Envision something she or he hasn’t seen or done before and figure out what is needed to make it happen. Then … make it happen. It’s title promotes unnecessary parental mania, but once you get past that bit of self-marketing, I think this Atlantic article offers five great ideas for helping parents encourage numeracy (my word, not the article’s) in very young children. Here are its key points. Talk about numbers. Don’t just count to ten, refer to physical objects to help young ones make connections. Talk about math with your hands. Point to objects as you talk about them. Connections between multiple representations is huge for brain development. Engage your child in spatial play. The article talks about puzzles (more below), but I’d add rolling balls, stacking blocks, and more. Engage your child in number play. Play games like Chutes & Ladders to encourage counting. These are all great points and not particularly revolutionary if you think about it. So, I’d like to add a few topics to the list from my play with my own children. Play with blocks, Legos, etc. Get down on the floor and stack those blocks yourself alongside your child. Sometimes build your own tower and sometimes add to your child’s creations. The connection time is great, and your child learns greater creativity by trying to imitate some of your more sophisticated constructions. Talk about what you’re doing, but if your child doesn’t seem to care or follow, no problem! Over time, the ideas will sink in, and you got quality time anyway. As they get older, play Jenga or–even better–make your own game of Jenga using blocks. Don’t forget to laugh and have fun when the tower falls and you get the chance to rebuild the original tower. For young children, play with a much smaller stack of bigger blocks. 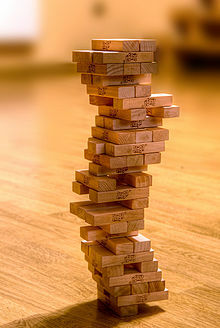 Check out this sophisticated Jenga tower. What else can you and your child make with this game that can be good for years of play? Play with jigsaw and similar puzzles. I’m quite fond of the great creativity of most of the Melissa & Doug and other similar puzzles, but they can be pricey. I save lots of money on puzzles at local consignment sales. 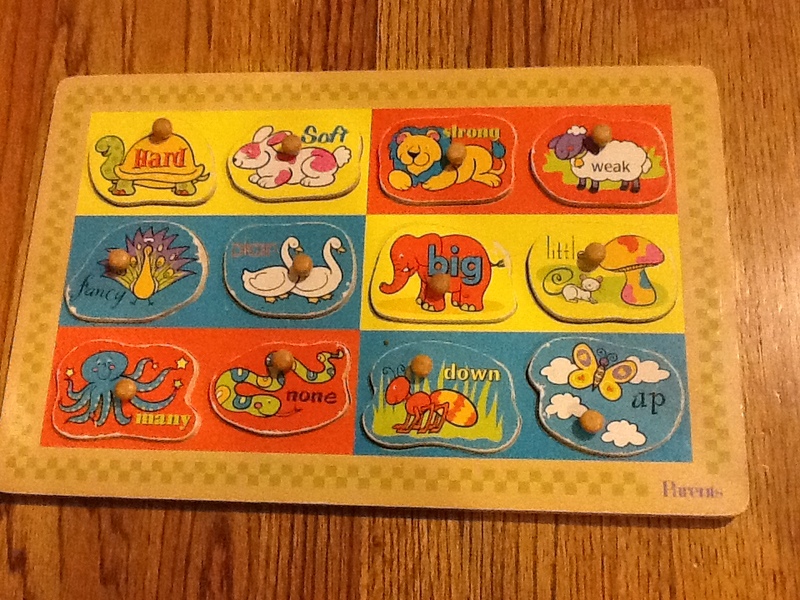 Early puzzles for my kids have knobs on them to enable easier handling. Long before they figure out how to put them back in place, you can use the pictures for conversations about names, colors, etc. So much room for general creativity! Before they can assemble them, we put puzzles like the one below in their play space. 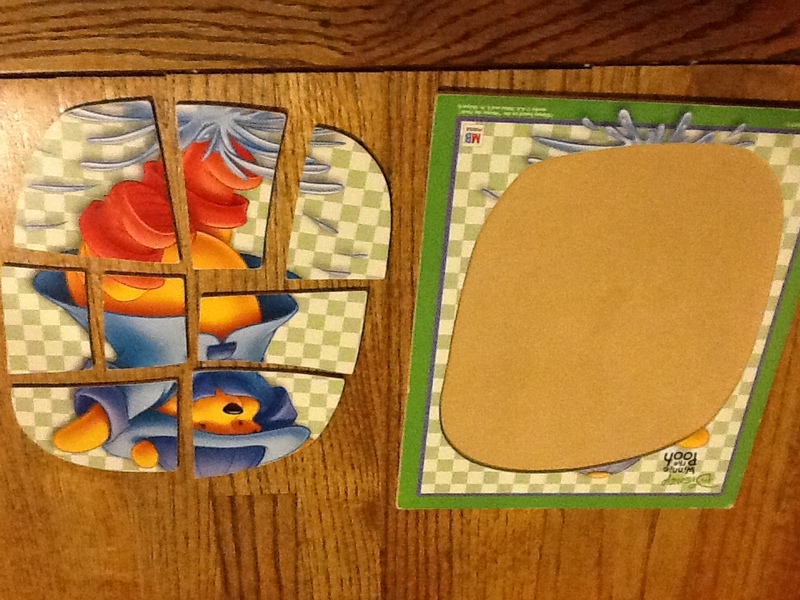 Straight-edged puzzles eventually give way to more traditional jigsaw puzzles. As they got more sophisticated in their thinking, we encouraged them to assemble connected puzzles outside their frames. As always, other games with the puzzles are great: How many pieces does the puzzles have? What colors are there? What is Pooh doing? Tell me a story. I was about to put away some very simple puzzles when my oldest daughter created a new game. She knew the early puzzles were too simple, so she turned all the pieces upside down and tried to reassemble them without the aid of pictures. We sometimes work more complicated, increasingly difficult jigsaw puzzles together. Talking about shapes, colors, and searching for where individual pieces might fit into the big picture of the final puzzle are all great activities. Pointing to part of the picture on a puzzle box and then pointing to the corresponding location in the puzzle as it is assembled is a tremendous lesson that helps children make connections between multiple representations of ideas. 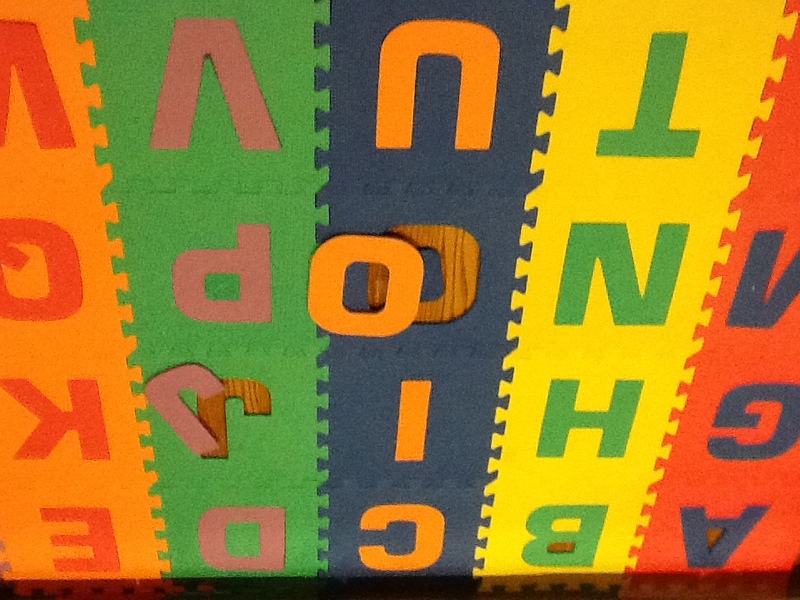 We also have a big foam floor puzzle of the alphabet (Thanks, N!). In the earliest days, it was a nice floor pad. It comes apart and can be assembled in different ways. Actually, being able to disassemble is a great early skill for children (good to remember when you’re annoyed the 100+ times you put it back together yourself). Some pieces are easier to put back than others, but cheer every time they accomplish a new task. Sometimes we sit in another room and ask them to retrieve a specific letter. We’ve encouraged early literacy by connecting every letter with something familiar: “D is for Daddy”, “Y is for yogurt”. They remember these special relationships long before they’ve memorized the alphabet. Literacy and numeracy are not isolated skills. Don’t forget to try something unusual. I’ve had great fun making blocks and fences out of this floor puzzle. My girls giggle as we build interlocking walls around them, creating and filling in windows, etc. When they’re older, draw pictures of their room or maps of your home. It doesn’t matter if the scales are right or the pictures are accurate. Show them on maps of your neighborhood, city, state, country, or world where they live and where special family and friends live. Revisit this when you travel or walk with your child. Connections between the real world and 2D maps can be tough, but are phenomenal skills for later mathematical abilities. Older games we’ve used that also happen to be great for visual-spatial development Connect 4 and the absolutely glorious Blokus. I’ll post more on this game another time. WARNING: I’ve said this before, but I worry about parents who might succumb to the mania suggested by the Atlantic article’s title. Education of children should not be about competition or creating math whizzes. Play, model creative play yourself to encourage their creativity, cheer for your kids when they do something new to encourage out-of-the-box thinking, don’t worry if your kids don’t get it right away, be patient, be 100% willing to move to a different task/game if your child isn’t interested, and make connections. Growth will happen if you keep them surrounded by challenges and point out how much fun it is to think, to create, and to solve. Every student should have access to a CAS (Computer Algebra System) in a handheld and/or computer-based format at least as early as he or she begins learning algebraic concepts. Of course, to use a CAS, one needs to learn how to ask questions and how to interpret the solutions. A CAS will always provide an answer to the question asked. Users must know precisely what is being asked so that they can interpret their results.